Natalie Tobert PhD will offer a half day workshop on themes from her book, exploring assumptions about western models of mental health. It is open to medical and health care professionals and would be suitable for continued professional development. The workshop explores social groups who express dissatisfaction with western bio-medical models of mental health diagnosis and treatment. These include peoples whose lands have been colonised; culturally new migrants; service users, carers, or survivors; plus psychiatrists and other mental health practitioners who are aware their training doesn’t fit the spirit of our times. Using contemporary examples, we will examine various approaches to mental distress. 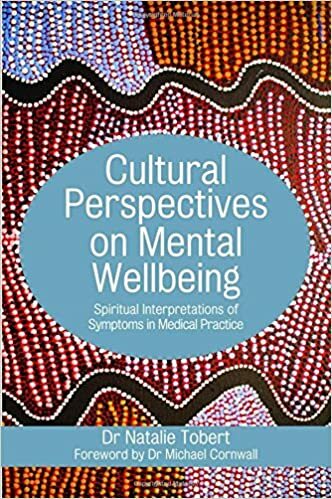 Using the discipline of medical anthropology, we discuss a variety of cultural ways of understanding ‘mental health’, extreme or anomalous experiences, and the interpretation of symptoms. We will explore the extent to which ancient wisdoms of originally remote societies were based on spiritual realities, which westerners had held ‘in secret’, but which are now becoming popular and mainstream.  Very professional, well paced.  Very balanced and thought provoking, excellent. Cost of Workshop: 30 euro per person. Refreshments: Complimentary tea/ coffee will be available mid morning. For more substantial food before or after, there is a cafe beside the lecture room which serves an all day breakfast at moderate cost and several restaurants serving lunch within five minutes walk. Venue: The Westpoint Academy, Monastery Road, Dublin, 22. Tel 089-462 0681 for directions for one hour prior to the workshop. The half day session will be from 9.30am to 1.30pm on Saturday 12th November 2016. Dr Natalie Tobert is a British medical anthropologist, who conducted original fieldwork research in India, Sudan and UK. She facilitates participatory courses on Spiritual and Cultural Equalities for staff and students in hospitals, medical schools and universities. These innovative seminars create a bridge between mainstream and new paradigm education. She has run workshops in UK, USA, India, Switzerland, and Sweden. Natalie lives in London. Her most recent books are: Spiritual Psychiatries (2014) based on fieldwork around Sri Aurobindo’s Ashram in India; and Cultural Perceptions on Mental Wellbeing (2016), which explores spiritual interpretations of experiences for medical and health care practitioners.